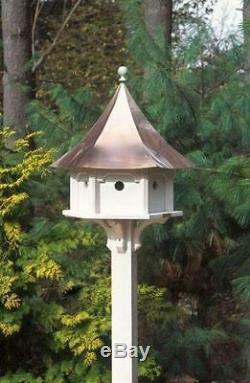 Lazy Hill Farm Designs Carousel Bird House with Polished Copper Roof. The base of all of our bird houses and feeders are made of a solid cellular vinyl a wood alternative that gives you the look and feel of wood with little maintenance. The end result is an architecturally pleasing house that looks like wood but lasts like vinyl. The redwood roofs are made to endure the elements year after year. The shingles will weather to a silvery gray. Our copper tops age over time to a natural patina or you may choose a verde roof that will give you the patina look right out of the box! We make our bird houses and bird feeders with a solid cellular vinyl a wood alternative that gives the look and feel of wood with little or no maintenance. We also offer posts made of vinyl and our natural cedar posts for those that prefer the unstained rustic look. Beautifully crafted each of the six compartments may be accessed by simply lifting up on the holes. The body is made of solid cellular vinyl a wood alternative with the look and feel of wood with little maintenance. Roof available in Polished Copper or Blue Verde Copper. Roof removes for easy cleaning. The item "Lazy Hill Farm Designs Carousel Bird House with Polished Copper Roof" is in sale since Tuesday, November 01, 2016. This item is in the category "Home & Garden\Yard, Garden & Outdoor Living\Bird & Wildlife Accessories\Birdbaths". The seller is "shopchimneycom" and is located in Monsey, New York. This item can be shipped to North, South, or Latin America.